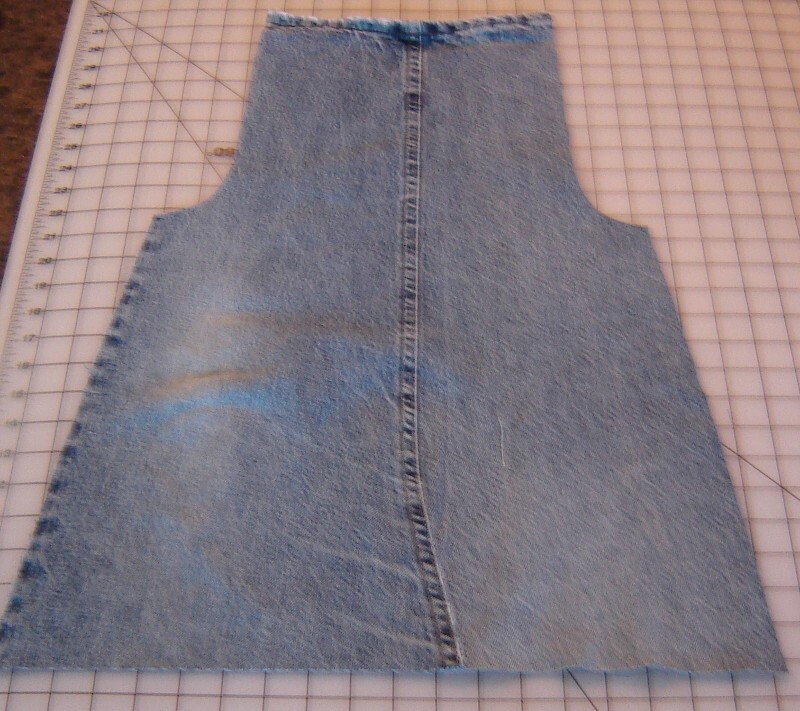 Yes I have another jeans apron tutorial. This one is by request of my 13 year old son. He wanted a new apron. It had to be durable and boy friendly. 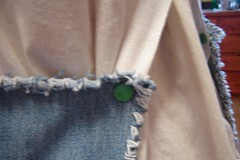 So here is yet another Jeans Apron tutorial. Yes I know that make 4 of them now. My mother had this hanging on the wall of our home when I was growing up. I love writing tutorial for re purposing found objects. Well on to the tutorial. 1 pair of old Jeans. Straps - can be heavy twill tape, wide ribbon, fabric sewn, or even left over strips from the jeans. Snaps, buttons, or something to make it it adjustable. 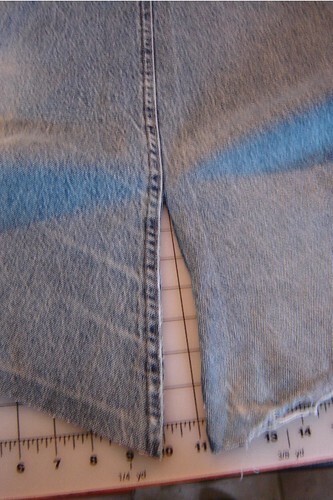 Take the jeans and cut them off at the top of the leg. (just below all the pockets. Save the pockets for the pockets on your apron. 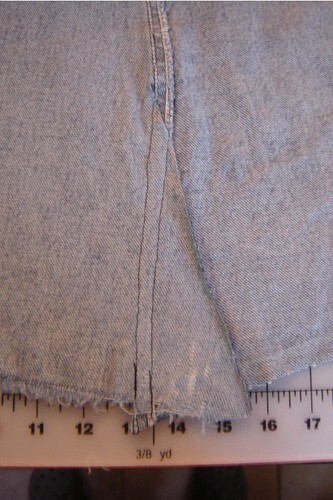 Cut the leg of the pants open along the outside seam or the one that is not the flat fell seam. What is that? Here is a picture of the flat fell seam. DON"T CUT THAT ONE. Lay this leg out flat on your cutting surface. 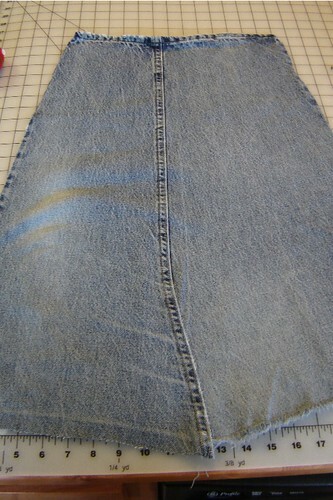 The cuff or bottom of the pant leg will be the top of your apron. 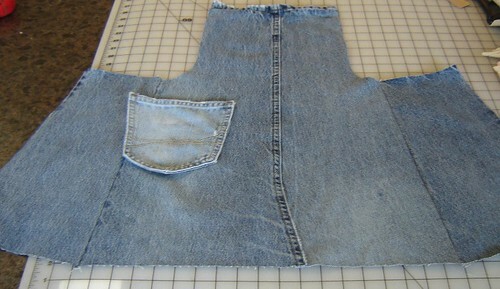 For an adult or large child size apron, you will want to use as much of the length of the leg as possible. For a child's apron you can measure down from the hem of the leg how far you want the apron to be long. You will notice if you are using the whole pant leg that the middle seam of the leg will not lie flat. Where the seam meets the crotch of the pants it is tapered and usually I just cut above it so I don't have to deal with it. Well this time I wanted a little more length to the apron and since they are short legged jeans, I had to use that bit of the pants. So I cut the seam a few inches up until it would lie flat. Be sure to cut the side that goes under the seam. 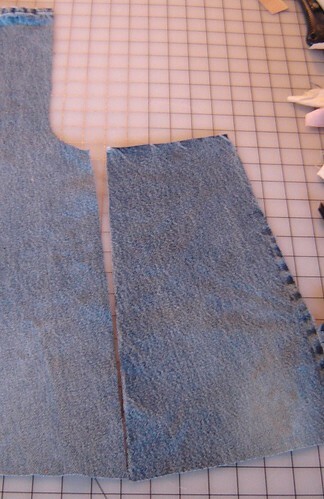 Then slide one cut side under the seam so that the piece of fabric will lay flat. pin in place. 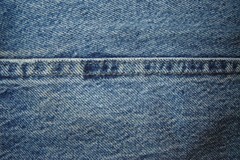 Stitch it in place, following the stitching lines of the jeans' seam. 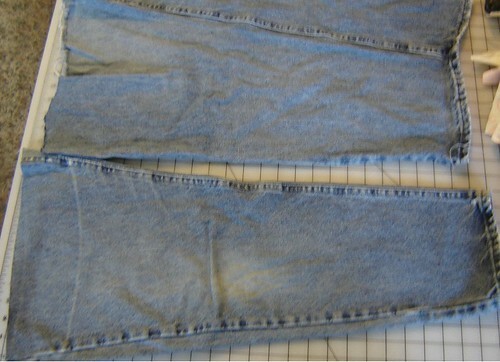 I use gray or light blue thread when sewing on jeans because it becomes invisible. That way you can stitch right over existing seams and it doesn't show at all. Now you will want to trim up the apron. You will find that one side of the pant leg is wider than the other. I try to even them up. 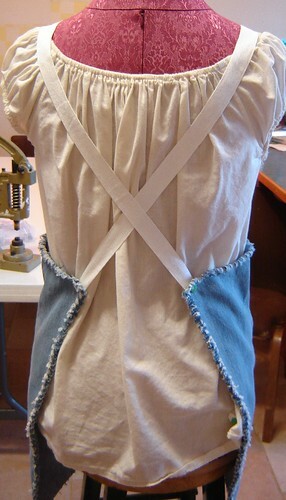 Next you will want to add an arm curve to the bib of the apron. I cut my "J" shape at about 2 inches by about 8 inches. For yourself you can hold it up to yourself and see where you want it to hit you. You could stop here but we wanted an apron that wrapped farther around. So we took the other leg of the jeans and cut it open on both seams giving me two pieces. I cut two equal pieces to fit the side of the apron front. The length and width were determined by the front I had already prepared and the width of the pant leg I was using. 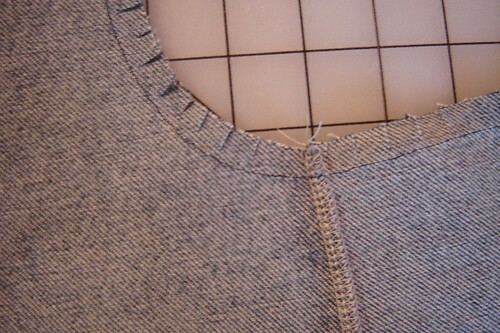 Sew the side pieces in place. I finished this seam off on the serger so it wouldn't ravel. I do recommend at least finishing it with a zigzag stitch. 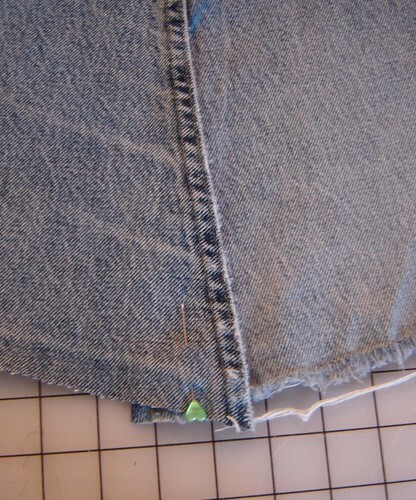 For the pocket of the apron I cut off one of the hip pockets of the jeans I used. I cut around the outside edge of the pockets and then cut off the inside fabric as well but left the pocket seams intact. I placed the pocket where I wanted it and stitched it in place with gray thread. I followed the stitching on the pocket seam. 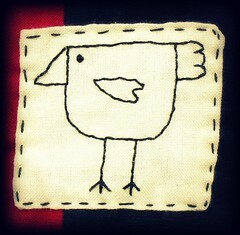 Again my stitching was invisible. 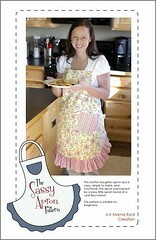 Now you will want to finish off the seams of this apron. Because this is for my son and he wants to wear it out in the woods while digging around and exploring the pond I chose not to spend too much time fussing about the outside edge. I stitched around the whole edge of the apron with a 1/2 inch seam allowance. I then clipped all but the top seam with my scissors. Then I washed and dried the apron to "rag" the edge. You could also finish of the edges with bias binding tape that you purchase from the store or make yourself. You can also fold the edges under but be warned that this gets very bulky with jeans. For the ties I stitched two lengths of heavy twill tape at the shoulder and crossed them over the back. Because this apron is for my growing boy I figured I had better make it adjustable. So I put snaps at the back corners of the apron and on the bottom edges of the straps. If you are making this apron for yourself or someone that is not likely to grown anymore, you can just stitch the straps in place. I chose this style of straps because there is no tying and you can just slip it over your head and are ready to go. If you don't have snaps you can sew a button hole in the apron and sew buttons on the straps. If you prefer traditional ties you can sew ties at the neck and the corners of the apron sides and tie the traditionally. 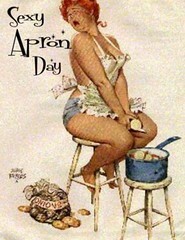 This IS your apron so make it the way you like. Here is my finished apron. You can doll the apron up with some rick-rack or a ruffle of fabulous fabric or a colorful patch to cover some hole in the jeans. :o) I can't wait to see what varriations you come up with. I love this apron. I have a pile of old clothing at my house set aside for repurposing. Thank you so much for this fun idea! 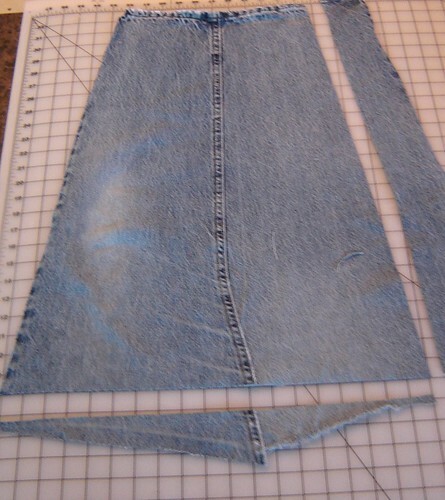 I just found your blog about a month ago as I was searching apron patterns and I have been planning to make your jean half apron, but this one may get made first. So CUTE! Thanks for sharing. your tuts are the best! thanks for the inspiration! I love this apron. 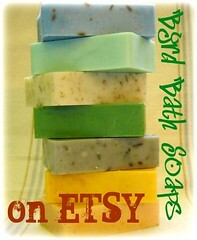 I am going to try and make one tomorrow. i have a jeans pile just for things like this. I'll start making one for my sister this evening. Thanks! Thank you so much for putting together these tutorials. Using them I was able to make two aprons (I'm not much for sewing so it was a huge feat for me.) they turned out really cute. I'm planning on giving them as gifts for Christmas and I love the idea of using old jeans. 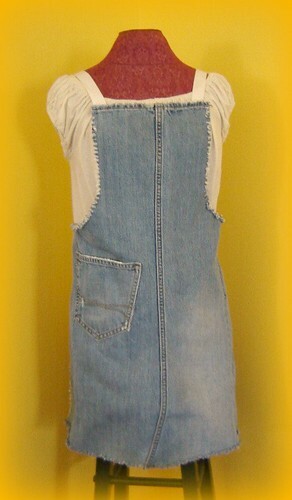 new to your blog, so you may make these too, but I enjoy making aprons out of denim bib overalls! Little kids and big kids.....course, I love making anything out of denim! 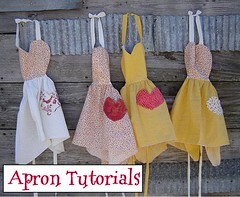 An apron is a usefull idea! I just finished a skirt by combining an old jeans and two summer-trousers. Just trying, mixing and fixing. It's fun to recycle. 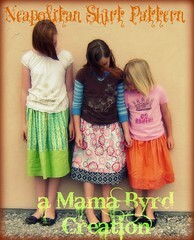 Tessa Bloomers and Matching Bag Giveaway!! !